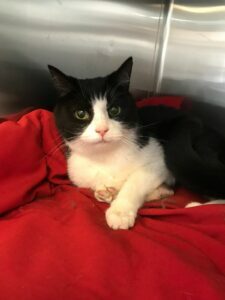 Meet Hamilton, a seven year old black and white feline. 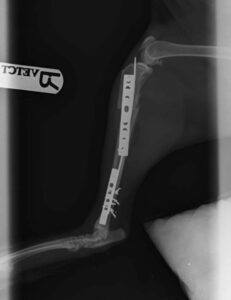 He suffered (what was almost certainly) a car accident and fractured his tibia in two places. Spookily, Hamilton has the name of Lewis Hamilton and a mechanic at the Bahrain F1 Grand Prix this weekend also suffered a double tibial fracture. Like many cats with severe fractures, Hamilton was limping but otherwise bright and happy. 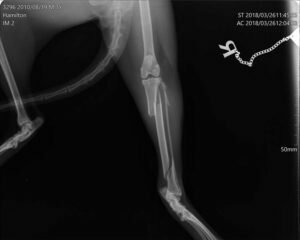 X ray, however, showed a double tibial fracture. 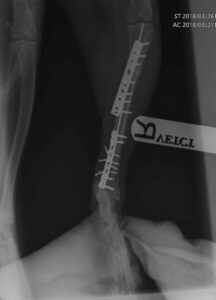 This is a serious injury for any animal, but our Surgical Certificate holder, Suanne, repaired the break by using two plates and screws, one over each break, some wires around the fragments (called cerclage wires) and a pin down the centre of the bone to aid stability. This all makes for an impressive looking X ray. Hamilton is recovering nicely, he has to be kept confined in a cage (we keep a few cages to loan out to cases like this) for a few weeks which he finds very frustrating. This is equivalent to a person being ‘signed off’ and advised to rest but once a cat feels OK they want to be out and about again and can’t understand why we won’t let them! Once we are happy he is healing nicely, he will be allowed ‘room rest’ and then hopefully get back to a full and active life as soon as possible. If we let cats have free roaming outside then there is always a risk of being hit by a car. It is difficult to prevent this, you can keep your cat indoors all the time but some owners (and some cats!) find this unacceptable. Keeping your cat in at night helps too, at least in the day time drivers can see cats and try and avoid them. There may also be ways of altering your garden to make it difficult for a cat to access the road. At the end of the day, it is a sad fact that if you want your cat to enjoy the freedom of outdoors and be around you when you are in the garden, then you have to weigh up the risks of road accidents (and other types of misadventure too – cats are naturally curious). Easter Chocolate Warning Platelet Enhancement Therapy – it’s a Cracker!